There are many tutorials available that shows how to create a new Lift project, building and running using Maven. If you like maven and think that it’s fine, you should probably follow one of those, since this is the most common setup and you’re likely to find help on the mailing list. We’ve decided to use Gradle. The Simple Build Tool is a cool build tool aimed primarily at Scala projects. It has nifty support for continuous compilation and testing. I haven’t used SBT, but hear it’s quite good (Lift may eventually move to SBT). But I think many of the features that are cool about SBT (ie. the continuous compilation and testing) are most useful during development if you’re just using a text editor. If you’re using an IDE (such as Eclipse) it already handles this. That’s it. No need for Maven, Gradle, Scala or anything else since we’re using a the nice Wrapper feature of Gradle that automatically downloads and installs the correct version of Gradle. In these posts I’ll use the versions of various software that I know work. Both Scala, Lift and Gradle are about to release new versions which will improve many things, but I’m only using the Gradle pre-release. I’ll update the posts when the new Scala & Lift versions are more stable. This will fetch all the files from github. The project just created is a basic Lift application with database support (using H2) and simple user registration. The files follow a standard directory scheme. The scala files are in src/main/scala and the web files (html, images etc) are in src/main/webapp. The file src/main/scala/bootstrap/liftweb/Boot.scala is where you customize most Lift settings, it is run once during startup. Check out the Lift documentation for more details. 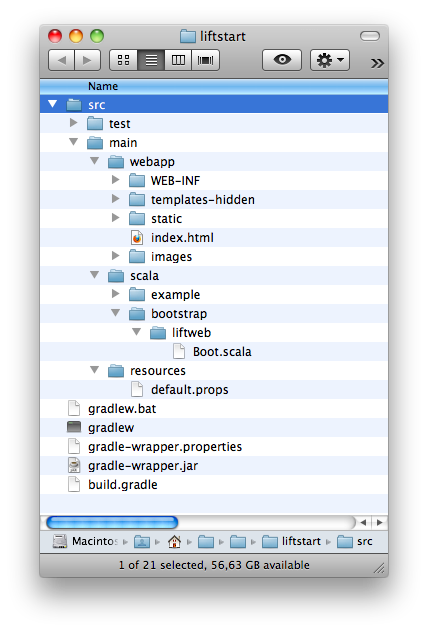 Gradle reads the build.gradle file to determine the tasks that are available in the project. The build.gradle in this project is fairly simple, mostly adding the scala-tools.org repository and specifying the dependencies needed to compile and test the project. This will create the file build/libs/liftstart.war which can be copied to the apps directory of any servlet container. Ok, so you’ve created a Lift project and know how to run it using Gradle. So go crazy and start hacking! But as you’ve probably noted, this is not exactly an efficient workflow since compiling everything from scratch takes quite a while. In a future post I’ll explain how to setup a fairly rapid development environment using Eclipse and JRebel. What about ‘future post’ which you mentioned? I have reached the point when compiling takes too much time, and I would love know how to setup JRebel. Thanks. As for the “future post” it’s still in the works 🙂 I’ve agreed with Miles (the author of the Eclipse plugin) not to post something on the Scala 2.7 plugin since it’s rather old now and basically unmaintained. Unfortunately, the 2.8 release have been delayed rather substantially and Lift didn’t work too well with some of the RCs. But it seems close now!